Falling on Tuesday 5th February, Chinese New Year celebrates the new moon at the end of the existing year, with 2019 marking the Year of the Pig – symbolising fun, fortune and wealth. Traditionally a time used to honour gods and ancestors with large family gatherings and feasts, we’ve pulled together the ultimate guide to finding your Chinese New Year essentials from around the Square. If you’re looking to show off your kitchen skills, Sainsbury’s in Poplar Way has a wealth of recipes to ensure your family and friends are left impressed by your homemade feast. 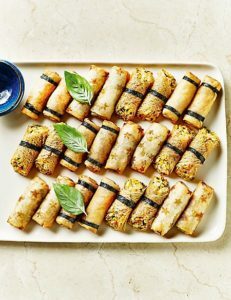 From snacks suitable for those sticking to healthy eating including baked spring rolls, to a luxurious mains like crispy five-spiced duck with noodles – there’s something for everyone. Not a fan of the kitchen but want to avoid a takeaway? Find all the party food you could need in the Food Hall at Marks and Spencer’s in Poplar Way. From platters of vegetable spring rolls to Gluten Free Sticky Asian-Style Chicken Lollipops, whatever your dietary requirements, you’ll find something that’s sure to go down a treat. So, if you’re looking for somewhere to discover exactly what you need to host the ultimate Chinese New Year party, there’s nowhere better to head than Poplar Way in Mell Square. Keep up to date with the latest news and information by searching ‘Mell Square’ on Facebook, Instagram and Twitter.